Promoted moderate voices in Chad, Niger and Burkina Faso through youth empowerment and community engagement, incorporating a variety of traditional and modern media from local theater to social media. 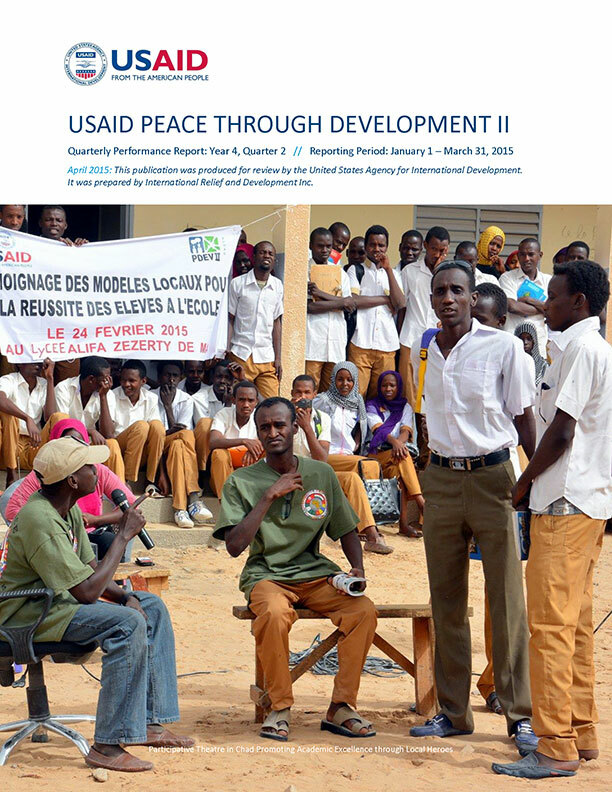 The Peace through Development II program (PDev II) aimed to decrease the risk of violent extremism (VE) in the Sahel. 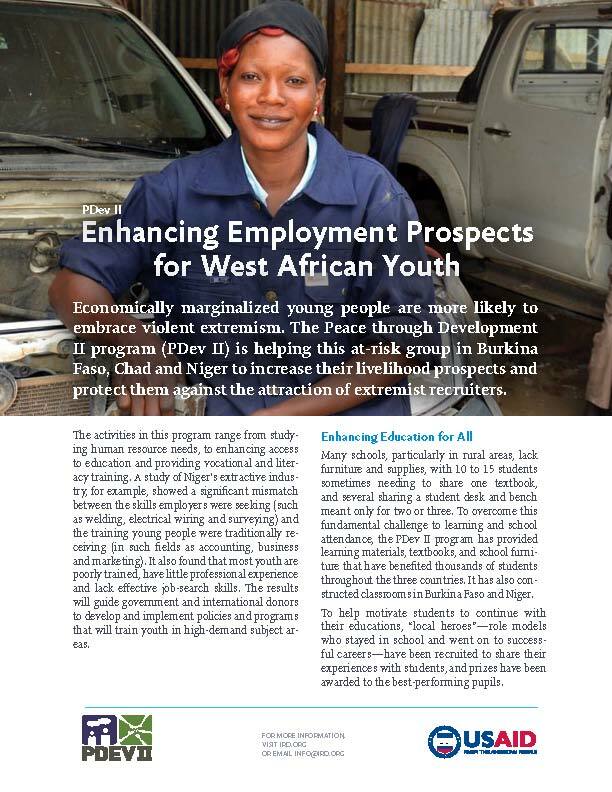 It employed a cross-sectoral, community-based approach to address the drivers of regional VE. 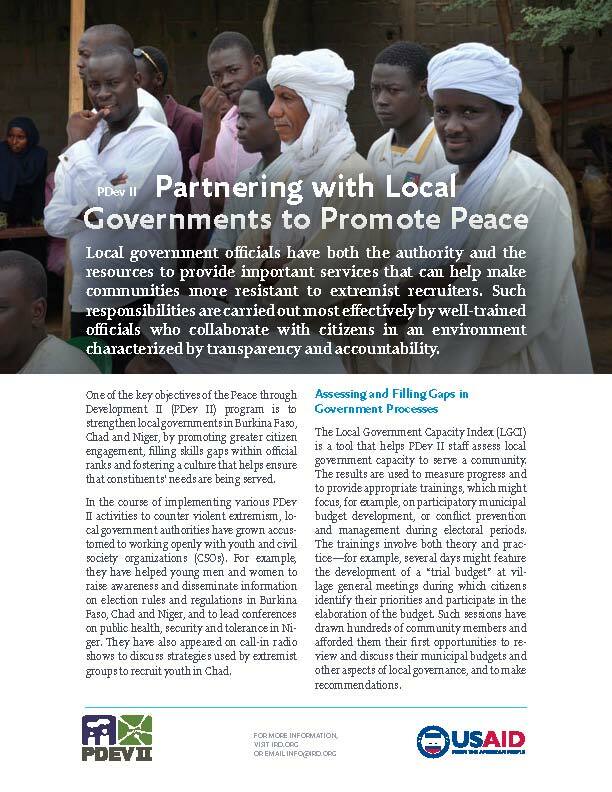 The program implemented a range of activities including vocational training and job placement, behavioral change oriented media and radio initiatives, participatory community development including small-scale infrastructure, and capacity building for youth associations, civil society organizations (CSOs), local governments and media outlets. 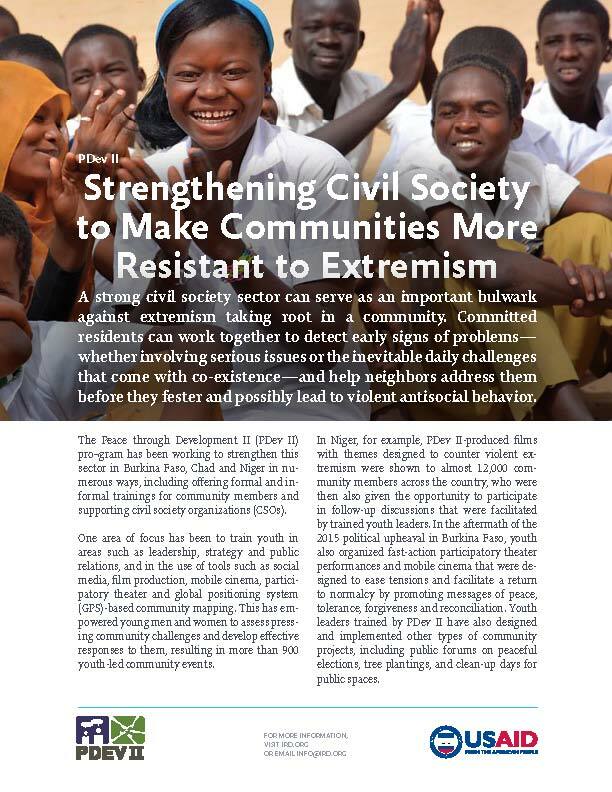 These community-led initiatives strengthened civil society and local government, promoted moderate voices, and engaged and empowered vulnerable youth in Chad, Niger and Burkina Faso. The program methodology was to work within traditional leadership structures and with moderate religious figures to counter extremist messages through imam training and instruction in faith-based peace-building. The program also worked to empower youth through community-driven, sustainable initiatives and provide them with an integrated set of leadership activities and livelihoods as an attractive alternative to VE. Blumont/IRD facilitated Stakeholder Forums to engage a broad range of local stakeholders in community planning and create ownership of activities that were further supported by Community Grants. This operationalized community planning and provided tangible benefits to marginalized communities. A key aspect of PDev II programming was its strong media component, strategically using mediums such as radio, print, social media, and community theater to amplify immediate program results, deliver effective messaging to counter VE and scale up interventions to positively influence the greatest number of people. Social media was used to target at-risk youth and other stakeholders, and program benefits were broadcast by community radios across the various regions within which PDev II operated. Through its media activities, PDev II supported improvements in media infrastructure, systems, and trainings for key radio personnel, in order to to expand access to information and positively influence community perceptions. Media activities supported original content development, production, management, marketing, income generation and accounting at 48 radio stations areas across PDev II core zones. In addition, PDev II led a widely popular participatory theater activity with master trainers and youth comedians addressing themes ranging from peaceful resolution techniques for land disputes to effective methods for countering drug use and drug trafficking. PDev II launched an innovative social media project that aimed to create a sustainable community of youth leaders who, through social media training sessions, acquired the knowledge and skills needed to produce social media content, thereby creating an effective venue for expression and a platform to connect like-minded youth. This multi-stage process included three phases aimed towards aligning with local social media influencers, engaging and creating a sense of agency, and encouraging sustained social media activity. By broadcasting non-violent inclusive messages, PDev II provided a platform and content that continues to compete against violent extremists for the attention of at-risk youth. Through the analysis of community-developed messaging, it was possible to determine the most effective methods and techniques for counter-messaging across different social media platforms, helping to define best practices and advise future messaging. To read more about the program, visit the PDev II microsite by clicking here. 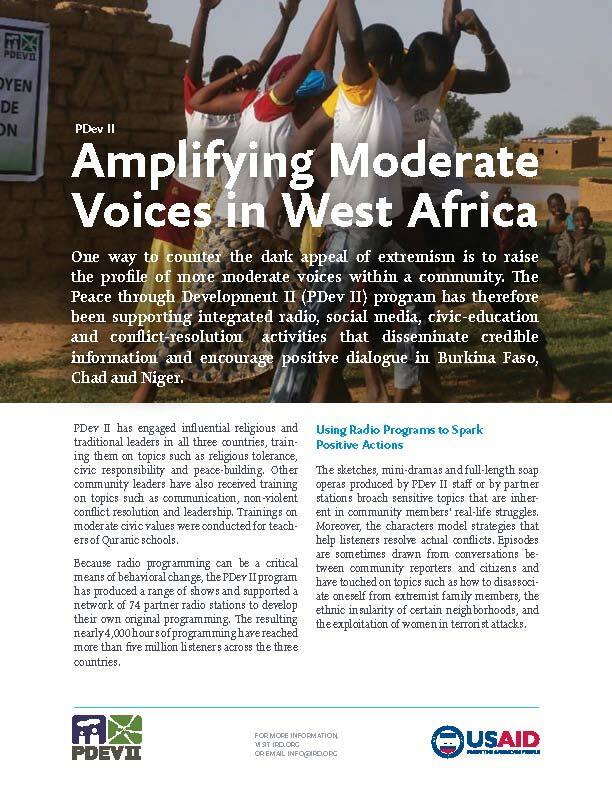 View Publication Initial findings on the Impact of the PDev II social media initiative to Amplify Moderate Voices in West Africa. View Publication Key data from 2015 a PDEV II program survey to evaluate the relevance of new media interventions in Burkina Faso, Chad, and Niger.